Well, it sure could also be a cleverly programmed Audio-Animatronic robot, couldn’t it? 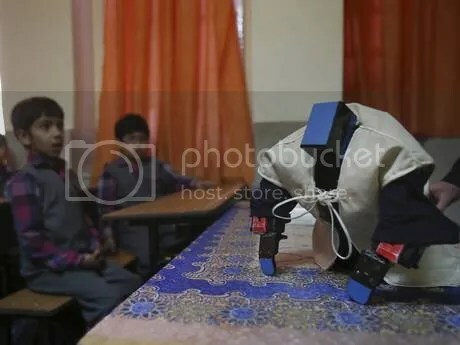 An Iranian schoolteacher has come up with a novel way of encouraging young children to learn their daily prayers. 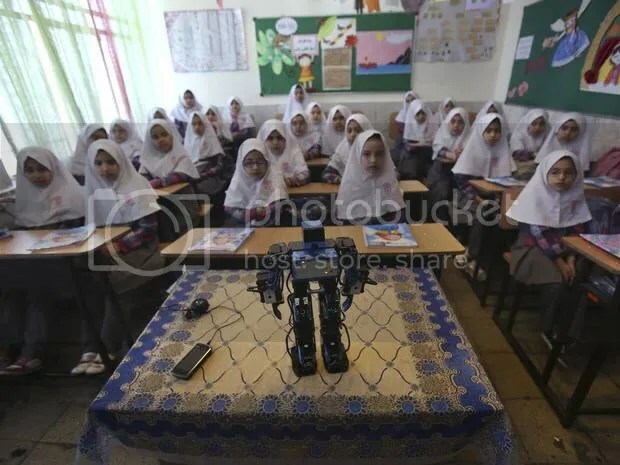 27-year-old Akbar Rezaie, who teaches the Quran at the Alborz elementary school in Varamin, near Tehran, took a robotics course and applied his knowledge to help modify an educational robot kit. He says the aim is to provide pupils with a stimulating visual example of a variety of Shi’ite worship. “I used to pray hastily but now I want to pray more slowly like this robot,” said one student. Now, pupils in this school and many others may soon have a new teaching assistant, along with the more conventional methods of teaching religious education. You aint see nothin’ yet in terms of what the unbelieving world will fall for. As stupid as people are, they will be even MORE stupid during the Tribulation (see Matthew 24:21ff) that is to come upon the world following the Rapture of Christ’s Church. This mass delusion will culminate in the worship of an evil totalitarian big government socialist who will be worshiped in place of Jesus Christ (Matthew 24:4-5 cf. Rev 13:4). And keep in mind that suckers will believe just about anything even in this day BEFORE Jesus Christ raptures everyone who has the Holy Spirit in them that guided them to some degree of truth in a radically depraved world. That’s how we got Obama. If you can’t believe how truly stupid and depraved human beings are NOW you won’t want to be around after the Rapture when there is no salt and no light when Christ will allow a Christ-despising world the opportunity to see just what hell their liberal secular humanist socialist ideology apart from God will get them. Meanwhile, the technology for “the mark of the beast” – the socialist big government totalitarian control over every single economic purchase on earth – is available whenever the Antichrist steps onto the scene. We are moving toward a cashless society – well over 99% of all money transfer today is ALREADY cashless. And with that move, along with the microchipping of individuals, Antichrist truly WILL be able to control every single purchase on earth so that no human can buy or sell without the mark. Look up, brothers and sisters in Christ, for the day of your redemption is truly drawing nigh. The beast is coming, as I’ve been saying, and the American people have foolishly and wickedly made sure his coming would be swift by voting for the beast’s Useful-Idiot-in-Chief, Barack Obama. Liberals are pathologically stupid and depraved people. They didn’t have to be; they merely radically chose evil and choosing evil means being determined NOT to see or understand the truth. So it didn’t matter how many times we warned liberals. They are too recklessly idiotic to comprehend. You simply cannot argue with dishonest people. They wave lies in front of you, they bait and switch, they change the subject with unrelated demagoguery, etc., etc. Even states that back Obama’s healthcare law worry about a jump in some insurance premiums as it takes effect. February 18, 2013, 3:00 a.m.
WASHINGTON — Less than a year before Americans will be required to have insurance under President Obama‘s healthcare law, many of its backers are growing increasingly anxious that premiums could jump, driven up by the legislation itself. “The single biggest issue we face now is affordability,” said Jill Zorn, senior program officer at the Universal Health Care Foundation of Connecticut, a consumer advocacy group that championed the new law. Exactly how high the premiums may go won’t be known until later this year. But already, officials in states that support the law have sounded warnings that some people — mostly those who are young and do not receive coverage through their work — may see considerably higher prices than expected. Oregon’s insurance commissioner, another supporter of the law, said new regulations could push up premiums for young customers by as much as 30% next year. He urged administration officials to slow enactment of the new rules. Did demon-possessed Nancy Pelosi tell you what was inside this wicked bill? Did demon-possessed Barack Obama tell you? Did demon-possessed Harry Reid tell you that this wicked law would cause premiums to skyrocket??? I remember all these liars and many other demon-possessed liars in the Democrat Party – which stands for “DEMOnic BureauCRAT” – promising you the exact opposite of reality. Because they are the party of lies and deceit. You keep on trusting the holocaust baby murderers, America. And you keep uncomprehendingly wondering why your country is sliding backward into meaningless mediocrity while your false messiah president keeps pumping out more and more of his demagoguery and lies. We warned you that ObamaCare would cause death panels. Democrats demonized us for predicting that. Now they admit that we were telling the truth and they were demon-possessed liars for saying there wouldn’t be death panels. We warned you that the law would massively drive up the cost of healthcare. Now Democrats are admitting that conservatives were right and they were all demon-possessed liars for ever promising you otherwise. We warmed you that a flood of doctors would flee the field of medicine and create a massive doctor shortage. We rightly predicted that companies would get out of providing their workers insurance coverage due to this wicked law. And now it’s happening just like we said it would. Now Democrats are admitting that their wicked bill is in fact driving doctors out of medicine and creating a critical doctor shortage just as they impose an evil socialist takeover of the health care system that demands more doctors than ever. Democrats are dishonest hypocrites: the unions who overwhelmingly back the Democrats and demanded this abomination be passed are now demanding that somebody else other than them pay the tab for it. So, yes, the article goes on (it’s the LA – as in Liberal Always – Times you know) to suggest that this “unexpected” massive cost to ObamaCare is really only temporary. Just a minor hickup, folks. But just remember that absoluately everything that the Democrats said about ObamaCare has been completely wrong. And this damn thing was sold as “not adding one dime to the deficit” when that was a complete lie that adding TRILLIONS to the deficit. How many times are you going to keep believing lies? You deserve this, wicked America. You deserve this and so much more. And now your going to pay the bill for your false mesisiah. California leads the nation. And these days California is leading America right straight into the hell this once-great but now depraved nation truly deserves. They’re the ones who are shocked, shocked shocked that 30% of the doctors the healthcare system needs to function are leaving medicine due to ObamaCare. I don’t understand how it could happen, either. I mean, pay the doctor less money (because they’re rich and Democrats say we should punish the rich, you know), dump more patients on him who can’t afford treatment, force them to move more way, waaaaay more paperwork to comply with the bureaucracy – and, yes, the death panels – and plant a few dozen bureaucratic agencies to watch over every single move you make ready to overrule your treatment decisions, and you’ll get more people entering medicine. Right? The other thing you can count upon is that demon-possessed Democrats will find a way to blame Republicans for the disaster they made the healthcare system with ObamaCare; and that a demon-possessed media will sell that lie and that a demon-possesssed nation will swallow that lie just as they have already swallowed so many other demonic lies before.